Eighty years ago, the Marvel Universe roared into existence with the publication of the now-historic MARVEL COMICS #1. Over the years, the company expanded mightily under the guidance of legends Stan Lee, Jack Kirby, Steve Ditko, and countless other industry titans. Today, Marvel is one of the most exciting and recognizable brands shaping pop culture, modern mythology and entertainment around the world – and this year, you can join millions of fans in celebrating MARVEL’S 80TH ANNIVERSARY. For all of 2019, Marvel will be honoring its iconic characters and stories across every decade of the company’s rich history – from the early years as Timely Comics, to the latest adventures in the Marvel Universe fans know today. Whether you have been following Marvel since the beginning or you’ve just discovered The House of Ideas, you won’t want to miss this year-long celebration across publishing, animation, new media, collectibles, games, and more. Starting this month and continuing through the year, Marvel will bring back some classic and reimagined Marvel Super Hero teams; revisit some of Marvel’s early classic titles, like MARVEL COMICS PRESENTS and MARVEL TALES; release facsimile editions and trade collections of your favorite issues and storylines over the decades – exactly as you remembered them – and deliver brand new takes on Marvel’s history, characters, and more. 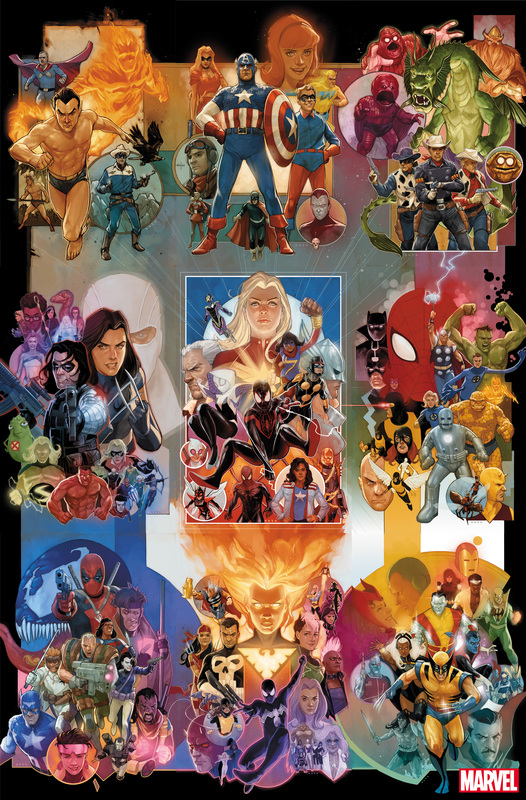 Marvel will also be featuring special 80th Anniversary-themed variant covers throughout the year, kicking off with nine connecting variants from superstar artist Phil Noto on select titles in January. Marvel’s digital shows and podcasts will feature special tributes for Marvel’s 80-year history throughout the year, including EARTH’S MIGHTIEST SHOW, THIS WEEK IN MARVEL, WOMEN OF MARVEL, MARVEL’S VOICES, MARVEL 101, and themed episodes of Marvel’s popular cooking show EAT THE UNIVERSE. Visit marvel.com to watch and subscribe. Keep an eye out for special Marvel’s 80th Anniversary exclusive merchandise, experiences, and live events at comic conventions, museums, D23, and Disney Cruises, and Disney Parks throughout the year – including virtual live events. For 80 years, Marvel has reflected the world outside your window – inspiring millions of fans with iconic characters and timeless stories that brought the Marvel Universe to the forefront of pop culture today. Celebrate Marvel’s historic 80th Anniversary all year long with your favorite Marvel comics, games, shows, collectibles, fashion, and more, Visit marvel.com/marvel80 or follow #Marvel80 for more information. This entry was posted in Uncategorized and tagged marvel by admin. Bookmark the permalink.